Siddiq Qidwai, a mechanical engineer at NRL, was a keynote speaker at the COMSOL Conference 2013 Boston, where he enlightened a packed auditorium with a speech on the significant costs and hazards associated with corrosion. Qidwai also explained the important work they are doing to better understand the mechanism of corrosion in metals. They expect that this new knowledge will aid in designing corrosion-resistant materials. “For the Navy specifically, corrosion is the number one maintenance problem,” explained Qidwai in his presentation. We can all certainly relate to that sentiment — on a much smaller scale — whether it’s a bicycle left in the rain, a car that’s endured a few too many harsh winters, or the pipes and metallic fixtures used regularly in our homes. Inspired by his presentation, the work of Qidwai and his colleagues was featured in the 2014 edition of COMSOL News, in the article “Simulation-Led Strategy for Corrosion Prevention” on page 36. 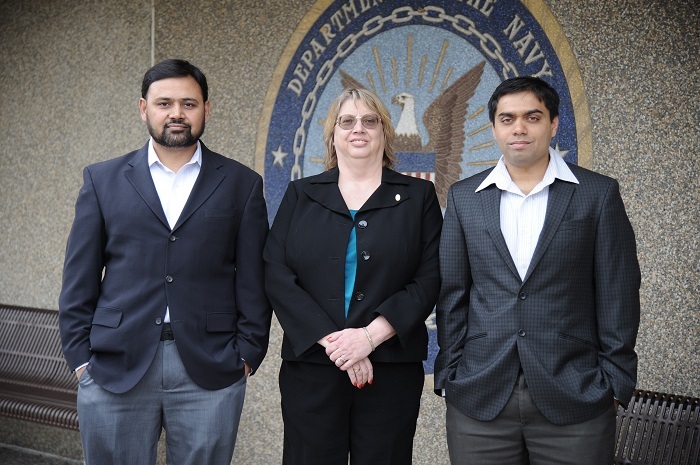 From left to right: Siddiq Qidwai (NRL), Virginia DeGiorgi (NRL), and Nithyanand Kota (Leidos Corp.), the researchers behind understanding the fundamental mechanism of corrosion in metals. Where corrosion starts and how it propagates depends on the microstructure of a metal. 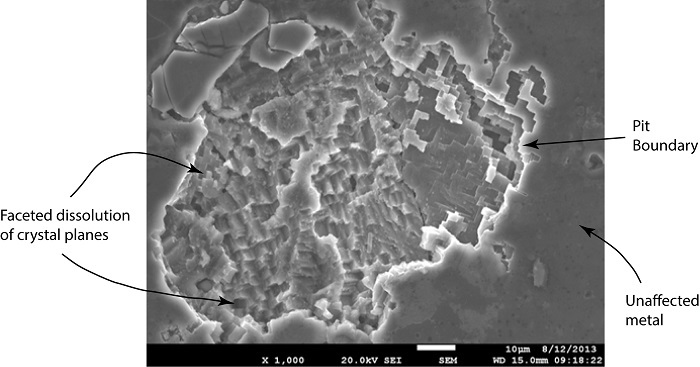 In the following figure, an electron micrograph acquired at NRL demonstrates the formation of an irregular surface due to pit growth in an aluminum alloy. If the microstructure were not important, we’d expect to see a much smoother surface in the image. Electron micrograph. Image courtesy of C. Feng and S. Policastro, NRL. 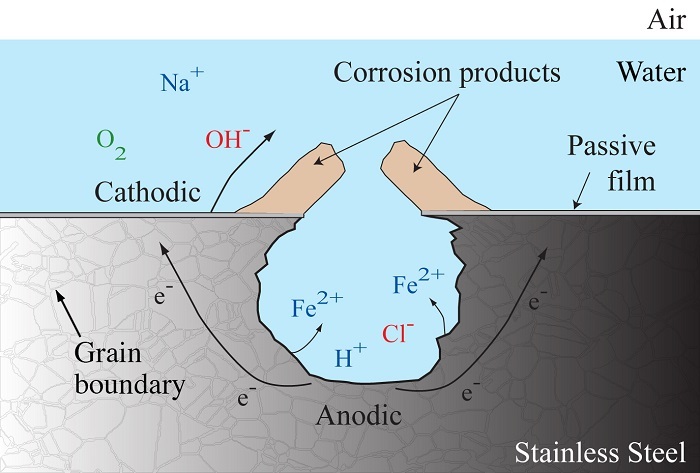 Pitting corrosion in metals is caused by electrochemical reactions and mass transport in an electrolyte solution, as shown in the figure below. The diagram depicts the general corrosion process for steel submerged in seawater. As corrosion proceeds, metal ions, such as Fe2+, diffuse into the electrolyte solution away from the metal surface, leading to the formation of pits. The diagram not only shows pit growth, but also the formation of an irregular corrosion front. The corrosion front is the surface along which electrochemical reactions occur. Diagram of the corrosion process. Along the front, the reaction rate varies due to differences in the size, shape, and crystallographic orientation of each grain. The microstructure of stainless steel is shown with the grain boundaries labeled in the diagram. The varied rate associated with each grain leads to the formation of an irregular corrosion front. Therefore, it is important to take metal microstructure into account when studying pitting corrosion in metals. Now, consider what happens as pitting corrosion progresses. The structure of a metal is disrupted, leading to areas of increased stress surrounding a pit, which consequently compromises its mechanical strength. If you’ve ever scored a piece of glass to make it easier to break, you can already relate to what’s going on. Unlike the process of breaking glass, for corrosion in metals, the reduced strength is undesirable and may lead to material or component failure. Hence, research at NRL aims to establish the relationship between microstructure, corrosion, and mechanical strength to aid in the design of corrosion-resistant materials. Qidwai and his colleagues are working toward developing a fully-coupled multiphysics model of pitting corrosion in metals, including the electrochemical reactions and mass transport. To overcome the limitations of previous research in the field, they have developed a method to incorporate metal microstructure into their model of pitting corrosion. Incorporating metal microstructure in a pitting corrosion model. Researchers at NRL were able to reconstruct the microstructure of steel from 3D images acquired using orientation imaging microscopy (OIM). The reconstructed metal microstructure is presented to the left in the figure above, along with a legend indicating the crystallographic orientation of each grain. To the right, you can see the model geometry implemented in COMSOL Multiphysics® simulation software. Implementing the irregular corrosion front movement due to metal microstructure presented a unique challenge in their simulation work. “At every location along the corrosion front, we have to determine the crystal orientation to calculate the corresponding corrosion potential, which in turn determines the corrosion rate and movement of the front,” says Qidwai. “LiveLink™ for MATLAB® has been an essential feature for us in order to include the effect of metal microstructure.” The corrosion potential, in particular, is determined in MATLAB® for a particular crystallographic orientation. Their work also includes decoupled structural mechanics analyses of pit growth in metals. 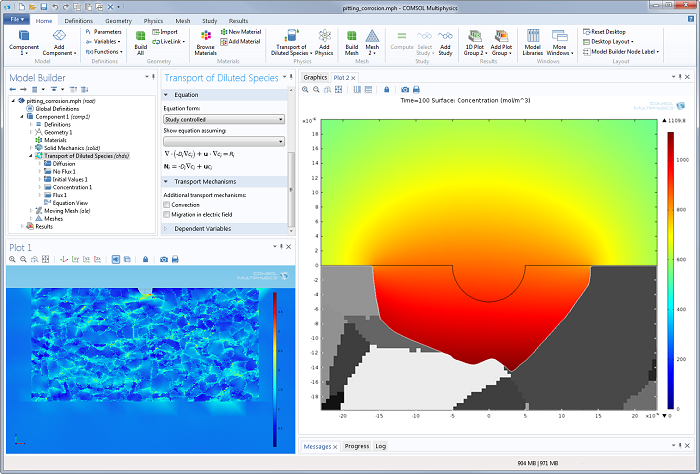 You can see what that looks like to the left in the screenshot of the COMSOL Desktop® environment below. The simulation results in the right-hand plot demonstrate pit growth with an irregular corrosion front. Future work at NRL will be directed toward creating a fully-coupled model of pitting corrosion that includes structural mechanics. This way, the effect of pit growth on the mechanical strength of the material is considered, along with the effect of mechanical loading on pitting corrosion. Once the model is completed and validated, it can serve as a valuable tool to aid material designers in creating corrosion-resistant materials, which is ultimately of enormous benefit to everyone. For more information about pitting corrosion research using multiphysics simulation at NRL, read the full article “Simulation-Led Strategy for Corrosion Prevention”. Watch the original keynote presentation on modeling pitting corrosion at the microstructural scale by Siddiq Qidwai from the COMSOL Conference 2013 Boston. Kota, N.; Qidwai, S.M. ; and DeGiorgi, V.G. ; “Modeling the Influence of Microstructure on Corrosion Pit Growth and Resulting Stress Concentration,” ECS Transactions, Vol. 58, No. 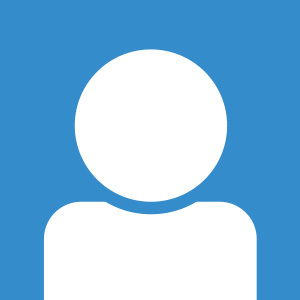 31, pp. 35-44, 2014.